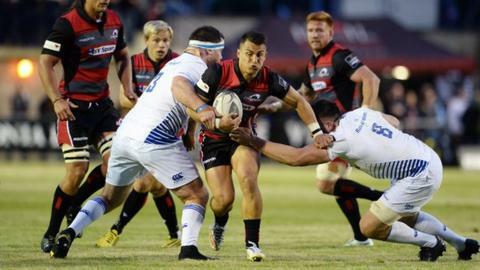 Edinburgh got the Pro12 season off to a winning start with victory over Leinster at Meggetland. It was a game of missed penalties, with Nathan Fowles and Jack Cuthbert missing as many as they scored for the hosts, and Isa Nacewa also passing up opportunities for the Irish. Ultimately, it was two tries from Damien Hoyland that made the difference for the hosts. The 21-year-old finished off two sweeping moves on either wing. It was Leinster who took the game to the Scots and reached the line early on, but gave away a penalty at the vital moment. They kept threatening, though, and Nacewa put a penalty through the posts after 16 minutes. The Kiwi could have doubled the lead six minutes later, but he put a long penalty wide. That gave Fowles the opportunity to level the scores, which he took, though he himself would miss a similar effort shortly after. Edinburgh lost Chris Dean to a head knock, but it did not disrupt the flow of pressure the home side were starting to exert. A neat move almost brought a try before the break when Mike McCarthy eventually dislodged the ball from James Johnstone's grasp. Neither side appeared to want to take control of the game. A penalty conceded by Dan Leavy right in front of the posts gave Fowles the chance to put his side ahead, but he sliced it wide to the right. Roddy Grant thought he had scored a try on 51 minutes, but it was rightly ruled as a knock on. However, there was no doubt three minutes later when Hoyland found room on the left-hand side to squeeze in. Nacewa put through the posts to close the gap, and after Cuthbert missed and John Andress conceded a penalty, the Kiwi had another chance but missed from distance. Then it was the exact opposite at the other end, Cuthbert trying his luck from distance, and this time he was successful. The game remained alive for both teams and with just over seven minutes left it remained finely balanced when Nacewa brought it back to just a two-point deficit. But Leinster's Dominic Ryan was sin-binned, and Edinburgh made the extra man count when they stretched the visitors, with Hoyland finding a big gap on the right and racing over the line. Cuthbert missed the conversation but it mattered little with the points safe. Edinburgh: J Cuthbert; D Fife, C Dean, S Beard, D Hoyland; P Burleigh, N Fowles; R Sutherland, N Cochrane, J Andress; A Bresler, B Toolis; C Du Preez, R Grant (capt), N Manu. Replacements: G Turner, A Dell, S Berghan, F McKenzie, H Watson, S Kennedy, G Tonks, J Johnstone. Leinster: I Nacewa; F McFadden, B Te'o, N Reid, D Fanning; C Marsh, L McGrath; M Bent, A Dundon, J Hagan; T Denton, M McCarthy; K McLaughlin (capt), D Leavy, J Conan.